Amphibians have become an icon of the global biodiversity crisis (1). Although a variety of factors are involved in amphibian decline worldwide, fungal chytridiomycosis has been identified as one of the major infectious diseases involved, resulting in the extirpation of >40% of amphibian species in areas in Central America and widespread losses across Europe, Australia, and North America (2, 3). Chytridiomycosis is currently considered to be caused by a single species of fungus, Batrachochytrium dendrobatidis, which is the only chytridiomycete taxon known to parasitize vertebrate hosts. However, B. dendrobatidis and other factors known to cause amphibian decline fail to explain several recent amphibian population losses (4, 5). A dramatic and enigmatic mortality event, which has brought this species to the edge of extinction, was recently reported among fire salamanders (Salamandra salamandra) in The Netherlands (5). Since 2010, the species has declined, with only 4% of the population remaining in 2013. This rapid decline coincided with the finding of dead animals in the field (5). The recent startup of an ex situ conservation program for 39 of the remaining fire salamanders was compromised by the unexplained death of 49% of the captive animals between November and December 2012. Attempts to identify known amphibian infectious agents, including B. dendrobatidis, in these salamanders yielded negative results (5). Instead, we found, isolated, and characterized a second, highly pathogenic chytrid fungus from this decline event that occupies a different niche compared with B. dendrobatidis. 59″), The Netherlands. Phylogenetic analyses including a broad range of representative chytrid species show that this fungus represents a previously undescribed lineage that forms a clade with B. dendrobatidis (Fig. 1; Table S1). Its considerable genetic distance from B. dendrobatidis (3.47–4.47% for the 1,513 18S + 28S rRNA base pairs) compared with the shallow divergences between B. dendrobatidis isolates (6) warrants the description of a unique species within the chytridiomycote order Rhizophydiales (family incertae sedis): Batrachochytrium salamandrivorans spec. nov. The unique chytrid represented by isolate AMFP13/1 (the holotype in liquid nitrogen at Ghent University) is the second chytrid known to parasitize and kill amphibians. In vitro, the unique taxon produces motile zoospores, which emerge from colonial (a single thallus containing multiple, walled sporangia) or monocentric thalli (Fig. 2A). The most obvious morphological differences, compared with the B. dendrobatidis type strain, are the formation of germ tubes in vitro (Fig. 2B; Fig. S1) and the abundant formation of colonial thalli both in vitro and in vivo (Fig. 3B). B. salamandrivorans grew at temperatures as low as 5 °C, with optimal growth between 10 °C and 15 °C and death at ≥ 25 °C, a markedly lower thermal preference compared with B. dendrobatidis (7) (Fig. 4). Chytridiomycosis has resulted in the serious decline and extinction of >200 species of amphibians worldwide and poses the greatest threat to biodiversity of any known disease. This fungal disease is currently known to be caused by Batrachochytrium dendrobatidis, hitherto the only species within the entire phylum of the Chytridiomycota known to parasitize vertebrate hosts. We describe the discovery of a second highly divergent, chytrid pathogen, Batrachochytrium salamandrivorans sp. nov., that causes lethal skin infections in salamanders, which has resulted in steep declines in salamander populations in northwestern Europe. Our finding provides another explanation for the phenomenon of amphibian biodiversity loss that is emblematic of the current global biodiversity crisis. Author contributions: A.M. and F.P. designed research; A.M., M.B., and F.P. performed research; A.M., A.S.-v.d.S., W.B., R.D., M.C.F., A.W., W.B., K.C., and F.P. contributed new reagents/analytic tools; A.M., F.B., and F.P. analyzed data; A.M., M.C.F., F.B., and F.P. wrote the paper; A.S.-v.d.S., A.W., and W.B. contributed field data; R.D. and K.C. performed histopathology; M.C.F. delivered DNA and genetic data; F.B. performed phylogenetic analysis; and A.M. and F.P. discovered the fungus. Data deposition: The sequences reported in this paper have been deposited in the GenBank database (accession nos. KC762294, KC762293, and KC762295), and the description of the fungus has been deposited in MycoBank (accession no. MB803904). Fig. 1. Maximum likelihood tree (−Ln L = 9,562.04266) for the analysis of a 1,513-bp data matrix of partial 18S + 28S rRNA genes. Together with B. dendrobatidis, B. salamandrivorans sp. nov. forms a well-supported clade [maximum parsimony bootstrap support = 100; maximum likelihood bootstrap support (MLBS) = 100; Bayesian posterior probability (BPP) = 100] of Chytridiomycota that parasitize amphibians with potentially lethal consequences. Squares on branches indicate MLBS > 70 and BPP > 95; triangles indicate MLBS < 70 and BPP > 95. Infected fire salamanders died within 7 d after a short episode of anorexia, apathy, and ataxia. The pathology consistently comprised multifocal superficial erosions and deep ulcerations in the skin all over the body. Keratinocytes with eosinophilic necrosis and marginated nuclei were at the periphery of the erosions. Each of these keratinocytes contained one centrally located thallus, the majority being segmented (colonial thalli). Bacteria superficially colonized the ulcers. Additionally, anywhere in the skin, small foci of keratinocytes immediately below the damaged keratin layer were found. These presented similar eosinophilic necrosis, marginated nuclei, and centrally located colonial thalli. The intraepidermal organisms did stain with immunohistochemistry (8) (Fig. 3A). Transmission electron microscopic examination of the skin lesions confirmed the presence of intracellular structures consistent with the colonial thalli (Fig. 3B). All animals were also screened for a wide array of other infectious diseases, but no evidence for any other pathology was found: neither PCR (9) nor quantitative PCR (qPCR) (10) suggested the presence of chytrid B. dendrobatidis DNA in the skin samples. Virological examination [including PCR for the detection of herpes viruses (11), adenoviruses (12), and ranaviruses (13) and inoculation of IgH2 (iguana heart epithelial cells) and RTG (rainbow trout gill) cell cultures for general virological investigation] was negative. Ziehl Neelsen staining, PCR for Chlamydiaceae (14), and bacterial isolation attempts did not yield any evidence of bacterial infections. B. salamandrivorans in their epidermal layers, with lesions identical to those described above. Cohousing on damp toweling effectively transmitted B. salamandrivorans and caused death in <1 mo. Experimentally infected midwife toads (Alytes obstetricans), the species that is most highly susceptible to infection by B. dendrobatidis in Europe (16, 17), did not show any signs of colonization by B. salamandrivorans, as determined by immunohistochemistry and PCR, or disease, suggesting a differential amphibian host range for the two chytrids. 2 of 5 | www.pnas.org/cgi/doi/10.1073/pnas.1307356110 Martel et al. fire salamanders. Additionally, 13 of 33 swabs collected from live fire salamanders from the declining population in Bunderbos, The Netherlands, in 2010 tested positive with this PCR, in contrast to 0 of 51 swabs from fire salamanders from a stable population in Belgium. Our PCR method thus allows the rapid screening of both extant populations and archived specimens for the presence of B. salamandrivorans–induced chytridiomycosis. Chytridiomycosis in amphibians can no longer be attributed to a single species of chytrid, but can be caused by either B. dendrobatidis or B. salamandrivorans. Our results reveal striking similarities and differences between B. salamandrivorans and the behavior of the hypervirulent global pandemic lineage of B. dendrobatidis (18). Both fungal species share at least the following hallmarks: (i) induction of a lethal skin disease and (ii) association with mortality events and severe population decline. In contrast, it is as yet unclear to what extent B. salamandrivorans is capable of infecting a broad amphibian host range, as is the case for B. dendrobatidis (3). However, development of erosive vs. hyperplastic/hyperkeratotic skin lesions, failure to experimentally infect midwife toads, and relatively low thermal preferences of B. salamandrivorans suggest differential host specificity of the two pathogens and possibly a differential effect on amphibian assemblages. Because the majority of recent B. dendrobatidis surveillance worldwide is based on the B. dendrobatidis–specific qPCR (10), it is currently impossible to estimate the extent and impact of B. salamandrivorans on amphibian populations worldwide using the B. dendrobatidis mapping framework (19). However, the emergence of the pathogenic B. salamandrivorans chytrid fungus is worrying and warrants close monitoring, urgent risk analysis, and its inclusion in any monitoring program assessing amphibian population health. Taxonomy. Batrachochytrium salamandrivorans Martel, Blooi, Bossuyt and Pasmans sp. nov. MycoBank accession no. MB803904. of motile zoospores. Motile zoospores roughly spherical, with highly irregular surface and cell surface projections; diameter 4.0– 5.5 μm (average 4.6 μm). Resting spore not observed. Growth at 5, 10, 15, 20, and 22 °C, but not at temperatures ≥24 °C. Death of thalli after 5 d at 25 °C. Five-day generation time at 15 °C. In Vivo. In epidermis of amphibians; forming predominantly colonial thalli that contain several walled sporangia. Thalli located inside keratinocytes; diameter 6.9–17.2 μm (average 12.2 ± 1.9 μm, n = 50). Zoospore Ultrastructure. Ultrastructure highly similar to that of B. dendrobatidis. Nucleus located outside the ribosomal mass, multiple mitochondria and numerous lipid globules. Position of the nonflagellated centriole in free swimming zoospores varies from angled to parallel to kinetosome. rDNA Sequences. Partial nucSSU rDNA GenBank accession no. KC762294, partial nucLSU rDNA GenBank accession no. KC762293, partial ITS1-5.8S-ITS2 rDNA GenBank accession no. KC762295. Etymology. The species epithet salamandrivorans (sa.la.man.dri. vo’rans. L. n. salamandra, salamander; L. part. adj. vorans, eating, devouring; N.L.part. adj. salamandrivorans, salamander-devouring) refers to the extensive skin destruction and rapid mortality observed in infected salamanders. 1% osmium tetroxide postfixation, and en bloc staining for 1 h in a 1% solution of uranyl acetate. Five S. salamandra specimens were found dead in the field during 2010 and 2011. Due to the severe autolysis of these animals, the postmortem examination was limited to skin histopathology and PCR for the detection of herpesviruses, adenoviruses, iridoviruses, Chlamydiaceae, and B. dendrobatidis. B. salamandrivorans Strain Isolation and Culture Conditions. Chytrid isolation on tryptone-gelatin hydrolysate-lactose (TGhL) agar plates containing penicillin/streptomycin (200 mg/L) at 20 °C was attempted from the dead S. salamandra as described previously for the isolation of B. dendrobatidis (7). Skin samples without contaminating bacterial or fungal growth were transferred to TGhL broth once zoospores were seen on the agar plates. The isolate was subsequently subcultured in TGhL broth in cell culture flasks at 15–20 °C. A 10-d-old subculture was frozen in liquid nitrogen (20). To obtain zoospores, 1 mL of a culture growing in TGhL broth was transferred to a TGhL agar plate and incubated for 5–10 d at 15 °C. Zoospores were obtained by washing the agar plate with 2 mL of 0.2-μm filtered pond water. The number of zoospores in the suspension was determined using a hemocytometer. B. salamandrivorans culture in TGhL broth at 15 °C was transferred to the wells of a 24-well plate, and 0.8 mL of TGhL broth was added. The plates were incubated at 5 °C, 10 °C, 15 °C, 20 °C, 22 °C, 23 °C, 24 °C, 25 °C, and/or 30 °C ± 1 °C for 10 d. Growth was defined as a significant increase of the surface of the well covered by the fungus compared with wells incubated at 30 °C (which is above the lethal temperature for B. salamandrivorans) and the presence of motile zoospores. The surface coverage was determined by image analysis (GNU Image Manipulation Program) of pictures, taken through an inverted light microscope (Nikon Eclipse ts100, 20× magnification). Each condition was tested in triplicate. If no growth was seen after 10 d of incubation, the plates were further incubated at 15 °C. Cultures were considered dead if no growth occurred within 10 d. B. salamandrivorans Molecular Characterization and Diagnostic PCR Development. PCRs were done on the chytrid culture obtained to amplify the 18S, 28S, and the 5.8S rRNA genes and the flanking ITS regions ITS1 and ITS2 (21). Based on the ITS1-5.8S-ITS2 sequence, the primer set (STerF 5′TGCTCCATCTCCCCCTCTTCA3′ and STerR 5′TGAACGCACATTGCACTCTAC3′) was developed and used to detect the 5.8S rRNA gene of B. salamandrivorans in skin samples from the six S. salamandra found dead in the field, six animals that died in captivity, and 33 swabs collected from S. salamandra in Bunderbos in 2010. Amplification reactions consisted of 10 ng DNA, 1 μM of each primer, 1.5 mM MgCl2, 1× Taq buffer, 0.2 mM of each dNTP, and 0.8 units of Taq polymerase in a volume of 20 μL. PCR amplification was performed under the following conditions: 10 min at 93 °C, followed by 30 cycles of 45 s at 93 °C, 45 s at 59 °C, 60 s at 72 °C, and 10 min at 72 °C. DNA of a pure culture of B. salamandrivorans was used as a positive control. Using primer set STerF and STeR, we assessed whether DNA of nine B. dendrobatidis strains would be amplified—Cape lineage (BdCAPE) isolates: SA1D, TF5a1, and CCB1; Swiss lineage (BdCH) isolates: Con2A, APEP, and 0739; and the global panzootic lineage (BdGPL) isolates: MAD, IA042, and JEL197. All derived amplicons were sequenced. Phenotypic Characterization. The morphology of the chytrid isolate in TGhL agar and broth was examined using inverted, phase contrast, and scanning (22) and transmission electron microscopy (23). Zoospores were collected from growth on TGhL agar plates and fixed for transmission electron microscopy with s-collidine buffer followed by osmium tetroxide (23). Experimental Infection of Fire Salamanders and Midwife Toads. The animal experiment was performed with the approval of the ethical committee of the Faculty of Veterinary Medicine (Ghent University, EC2013/10) under strict BSL2 conditions. Ten captive bred fire salamanders (S. salamandra) and midwife toads (Alytes obstetricans) were housed individually at 15 ± 1 °C on moist tissue, with access to a hiding place and a water container. All animals were clinically healthy and free of B. dendrobatidis as assessed by sampling the skin using cotton-tipped swabs and subsequent performing qPCR (10). Using the PCR described above, all swab samples were negative for the presence of DNA of B. salamandrivorans. After 1 wk of acclimatization, 1 mL of a zoospore suspension in filtered (0.2 μm) pond water, containing 5,000 zoospores/mL, was dripped on the five animals of each species. Animals were fed twice weekly with crickets and followed up by clinical examination and weekly collection of skin swabs until 3 wk after exposure. The skin swabs were examined for the presence of B. salamandrivorans DNA as described elsewhere. Skin Swabs from Declining and Stable S. salamandra Populations. Skin swabs were collected from 33 S. salamandra from the Dutch fire salamander population experiencing the decline during 2010. For comparison, skin swabs were collected from 51 clinically healthy fire salamanders from a population without a history of decline (N50°57′13″; E3°43′15″, Merelbeke, Belgium). DNA from the swabs was extracted in 100 μL PrepMan Ultra (Applied Biosystems) (8). Samples were examined for the presence of DNA of B. dendrobatidis using qPCR and for the presence of DNA of B. salamandrivorans using the PCR described above. Phylogeny. In addition to the unique chytrid fungus, our taxon sampling consisted of three B. dendrobatidis strains and 27 species representing a broad evolutionary range of Chytridiomycota. In addition, Rozella allomycis and two Blastocladiomycota (Allomyces arbuscula and Catenaria anguillulae) were used as outgroup taxa. Alignment was done with ClustalX 2.0.10 (24), and ambiguously aligned fragments were excluded for further analysis, resulting in a 1,513-bp reliably aligned data matrix. Maximum parsimony (MP) and maximum likelihood (ML) analyses were performed using PAUP* 4.0b10 (25). Heuristic MP searches were executed in 10,000 replicates, with all characters unordered and equally weighted, and using tree bisection reconnection (TBR) branch swapping. The strict consensus tree of 81 equally most parsimonious trees (tree length = 1,471) supported the (B. dendrobatidis, B. salamandrivorans) sister relationship and received an MP bootstrap support of 100. Bayesian and likelihood analyses were performed with the GTR + G + I model of DNA substitution. For the likelihood analyses, heuristic searches were performed with substitution rates, γ-shape parameter, and proportion of invariable sites estimated from neighbor joining trees. These parameters were reestimated from the best ML tree found thus far, and the tree was submitted to additional rounds of TBR swapping; this procedure was repeated several times. These maximum likelihood analyses resulted in a single best tree [−ln L = 9,562.04266; pinvar = 0.301311; shape parameter α= 0.60887]. ML bootstrapping was done in 1,000 replicates with fixed parameters. Bayesian analyses were done with MrBayes 3.1.2 (26). Two runs of four Markov chain Monte Carlo (MCMC) chains each were executed in parallel for 5,000,000 generations, with a sampling interval of 500 generations and a burnin corresponding to the first 1,000,000 generations. Posterior probabilities for clades were obtained by combining the post–burn-in trees from parallel runs in a single consensus tree. Convergence of the parallel runs was confirmed by split frequency SDs (<0.01) and potential scale reduction factors (approximating 1.0) for all model parameters. ACKNOWLEDGMENTS. 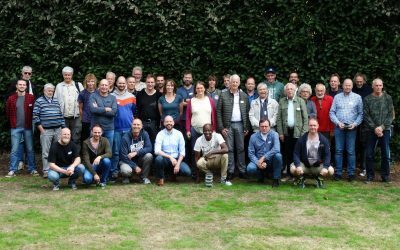 The technical assistance of M. Claeys, M. Couvreur, and C. Adriaensen is appreciated. We thank Dr. J. Z. Euzeby for his kindness in helping with the Latin for the species name. We thank the editor and two anonymous reviewers for their constructive comments, which improved the manuscript. I. Van Bocxlaer assisted with phylogenetic analyses. M.B. was supported by a Dehousse grant provided by the Royal Zoological Society of Antwerp. F.B. was supported by European Research Council Starting Grant 204509 [project Tracing Antimicrobial Peptides and Pheromones in the Amphibian Skin (TAPAS)]. M.C.F. was supported by the Biodiversa project Risk Assessment of Chytridiomycosis to European amphibian Biodiversity (RACE). Mendelson JR III, et al. (2006) Biodiversity. Confronting amphibian declines and extinctions. Science 313(5783):48. Panama. Proc Natl Acad Sci USA 107(31):13777–13782. Fisher MC, et al. (2012) Emerging fungal threats to animal, plant and ecosystemhealth. Nature 484(7393):186–194. Caruso NM, Lips KR (2013) Truly enigmatic declines in terrestrial salamander populations in Great Smoky Mountains National Park. Divers Distrib 19(1):38–48. Spitzen-van der Sluijs A, et al. 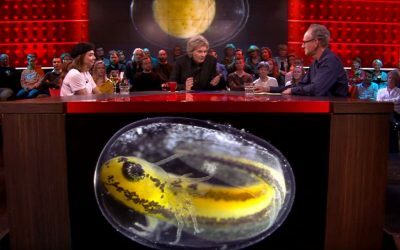 (2013) Enigmatic decline drives Salamandra salamandra to the edge of extinction in The Netherlands. Amphib-reptil 34(2):233–239. Rosenblum EB, et al. (2013) Complex history of the amphibian-killing chytrid fungusrevealed with genome resequencing data. Proc Natl Acad Sci USA 110(23):9385–9390. Longcore JE, Pessier AP, Nichols DK (1999) Batrachochytrium dendrobatidis gen. et sp. nov., a chytrid pathogenic to amphibians. Mycologia 91(2):219–227. Batrachochytrium dendrobatidis. Dis Aquat Organ 73(3):175–192. Annis SL, Dastoor FP, Ziel H, Daszak P, Longcore JE (2004) A DNA-based assay identifies Batrachochytrium dendrobatidis in amphibians. J Wildl Dis 40(3):420–428. 4 of 5 | www.pnas.org/cgi/doi/10.1073/pnas.1307356110 Martel et al. Boyle DG, Boyle DB, Olsen V, Morgan JAT, Hyatt AD (2004) Rapid quantitative detection of chytridiomycosis (Batrachochytrium dendrobatidis) in amphibian samples using real-time Taqman PCR assay. Dis Aquat Organ 60(2):141–148. Doszpoly A, et al. (2008) Molecular confirmation of a new herpesvirus from catfish (Ameiurus melas) by testing the performance of a novel PCR method, designed totarget the DNA polymerase gene of alloherpesviruses. Arch Virol 153(11):2123–2127. Wellehan JFX, et al. (2004) Detection and analysis of six lizard adenoviruses by consensus primer PCR provides further evidence of a reptilian origin for the atadenoviruses. J Virol 78(23):13366–13369. Mao J, Hedrick RP, Chinchar VG (1997) Molecular characterization, sequence analysis,and taxonomic position of newly isolated fish iridoviruses. Virology 229(1):212–220. Martel A, et al. (2012) Novel Chlamydiaceae disease in captive salamanders. Emerg Infect Dis 18(6):1020–1022. Berger L, Hyatt AD, Speare R, Longcore JE (2005) Life cycle stages of the amphibianchytrid Batrachochytrium dendrobatidis. Dis Aquat Organ 68(1):51–63. Bosch J, Martinez-Solano I, Garcia-Paris M (2001) Evidence of a chytrid fungus infection involved in the decline of the common midwife toad (Alytes obstetricans) in protected areas of central Spain. Biol Conserv 97(3):331–337. Walker AF, et al. (2010) Factors driving pathogenicity versus prevalence of the amphibian pathogen Batrachochytrium dendrobatidis and chytridiomycosis in Iberia. Ecol Lett 13:372–382. Farrer RA, et al. (2011) Multiple emergences of genetically diverse amphibian-infectingchytrids include a globalized hypervirulent recombinant lineage. Proc Natl Acad Sci USA 108(46):18732–18736. Olson DH, et al. ; Bd Mapping Group (2013) Mapping the global emergence of Batrachochytrium dendrobatidis, the amphibian chytrid fungus. PLoS ONE 8(2): e56802. Boyle DG, et al. (2003) Cryo-archiving of Batrachochytrium dendrobatidis and other chytridiomycetes. Dis Aquat Organ 56(1):59–64. Garmyn A, et al. (2012) Waterfowl: Potential environmental reservoirs of the chytridfungus Batrachochytrium dendrobatidis. PLoS ONE 7(4):e35038. Lechter PM, Powell MJ (2005) Kappamyces, a new genus in the Chytridiales (Chytridiomycota). Nova Hedwigia 80(1-2):115–133. Methods) (Sinauer Associates, Sunderland, MA). Ronquist F, Huelsenbeck JP (2003) MrBayes 3: Bayesian phylogenetic inference undermixed models. Bioinformatics 19(12):1572–1574.